Overloaded vehicles bogged on the beach, trailers absconding from vehicles, injuries in the night, lots of rain, flat tyres and lots of fish caught! 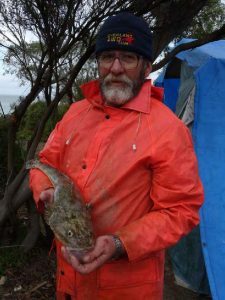 Yep – it must be the annual Overland 4 Wheel Drive Club Coffin Bay Fishing Trip. 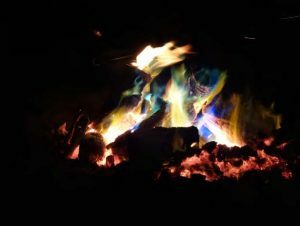 We all met at the Coffin Bay Caravan Park on the Saturday night for a planned departure into the National Park first thing Sunday morning. We woke to blustery and squally conditions, and lined up at 08:30 outside the local café ready to go into the park. We were down to six vehicles as Peter and Lynn were unable to join us due to Lynn feeling unwell. As usual, a quick stop at Yangie Bay to let down tyre pressures and then we were off. All went well until we ventured on to the notorious 7 Mile Beach. There was lots of seaweed on the beach due to the storms and king tides the previous week, and it didn’t take long before trouble struck. straps required to cover the distance and after several goes Les and Eileen were back on firm ground. pin from his tow bar and was pulling the camper along by its chains. After a search of vehicles a replacement pin was found and we were all mobile again. Not for long though! Les and Eileen became bogged on another section of soft sand. By this time 3 vehicles had rounded the last point and were nearly off the beach. 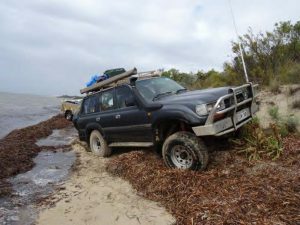 As the tide was coming in quickly, John gave Les a tow and with the aid of Les’s max trax and Steve’s rubber mats, Les was able to get through the soft patch. Unfortunately, his max trax were well and truly buried somewhere in the sand and we had to abandon the search for them. By this time, the water was lapping at the point and the beach was fast disappearing. There was nothing for it except to nose the vehicles up as far as possible and wait for the tide to turn. Thank goodness the small wall of seaweed managed to keep most of the water at bay, and no damage was done. 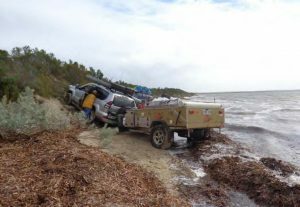 After a few hours the tide turned and we were able to join the other 3 vehicles at the camp site with no further incident – nearly 8 hours after leaving Coffin Bay. Monday was a lovely day and after Grant explained the competition rules the fishing was on in earnest. 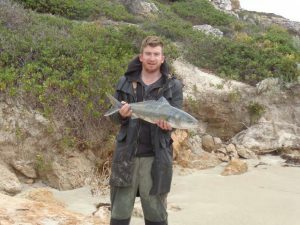 Andrew and Liam went off to the point to fish off the rocks and came back with a mixed bag of tommies, salmon trout and mullet. In the early hours of Tuesday morning, whilst answering a call of nature, Steve had the misfortune of tripping over and lacerating his finger on a tree branch. Luckily he had his own private nurse on call to administer first aid. Once the wound was examined in daylight, it was determined stitches were required and so Steve and Deb set off for Port Lincoln. 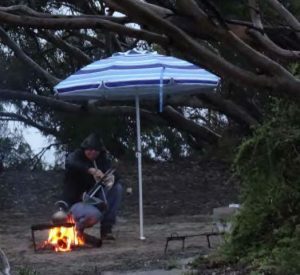 We got within cooee of the exit from the beach, but could not find a way through the huge amounts of seaweed and so had to return to camp minus the stitches. Fortunately we didn’t need to amputate. 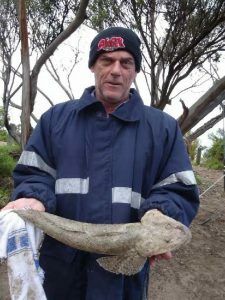 Fishing highlight for Tuesday was a decent 54cm flathead caught by Andrew. Wednesday was blustery with high seas, so we decided to head to Point Sir Isaac to try for some salmon. Both Andrew and Liam managed to catch their personal best size salmon – Liam’s weighing in at 2.2kg, and Andrew’s at a whopping 3.8kg. It was fish for tea that night! Thursday – lots of rain and a few lakes forming in the campsite. 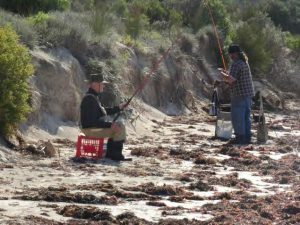 Another trip to Point Sir Isaac to see if another nice salmon could be caught – no salmon but a few Tommies in the bucket. Due to the anticipated weather conditions and tides, it was decided to delay our departure to Saturday. The boys made a last ditch effort Friday morning and rounded off the competition with a few more mullet. At 1400, Grant called everyone to muster for the competition wrap up. The competition categories were all put into the hat, with Eileen pulling out “the largest salmon” as the winner of the competition prize. As no-one had beaten the size of salmon caught by Andrew on the Wednesday, he was the proud recipient of a fantastic rod and reel kindly donated by Kym White from Brinks Marine at West Beach. It was a clean sweep for the Dalton clan, as Steve and Deb were joint winners of the booby prize for weighing in one mullet each with identical weights! The mounted fish trophy now has pride of place in the pool room! be reinflated so we could continue on. Thanks Grant for another eventful trip.